In: EKSU 2015/2017 graduands Collection of Convocation Gowns!! EKSU 2015/2017 graduands Collection of Convocation Gowns!! Ekiti State University, EKSU has issued a notice to 2015/2017 graduands on collection of convocation gowns for 2017 convocation ceremony. 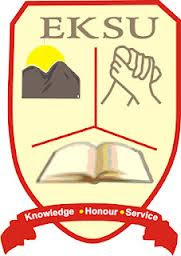 The management of EKSU also released the details of convocation. The Convocation ceremonies will involve the students who graduated from the University in the 2015/2016 academic session in all programmes. Kindly pay the stipulated amount into EKSU IGR Account No. 1008844821 in Any Branch of UBA Plc stating clearly your Name, Matriculation Number, Faculty, Department and year of graduation at the top of the Teller. The printed receipt for payment for robes should be kept intact as it will be required for collection of certiﬁcates or transcripts in future. The deadline for the submission of academic robes is Tuesday, 4th April, 2017, after which a late submission charge of Two Thousand, Five Hundred Naira (N2,500.00) per day will be paid. Damage or loss of an academic robe will attract a penalty of N50,000. Graduands who have completed their clearance will be eligible to collect their certiﬁcates during convocation.